Here are three delicious recipes I want to share with you. Lotsa eggs! Why? Because they're cheap, tasty and have a good amount of protein and healthy fats. BAM. So grab your grocery lists and start planning! If you're looking for a high-protein, high-fiber breakfast this is it. It takes 5 minutes to make and fills you up with a lot of the good stuff for a very low caloric price. Funny story: I was having breakfast with my dad one morning and upon noticing my plate piled high with eggs and veggies he looks over and says, "are you seriously going to eat all of that!?" Nodding, I said, "the best part is my manly breakfast is 4x as filling as your mini bowl of granola AND it's 1/3 of the calories." Win. Choose wisely and your food will fuel you. - salt and pepper, taste (or any other of your favorite seasonings. Directions: Set your oven to 400 degrees F. Line your baking sheet with tin foil. Toss broccoli in a large Ziplock bag with EVOO, garlic and lemon pepper tossed in (when I make this recipe I prefer to omit the salt and use lemon pepper to season). Shake liberally. 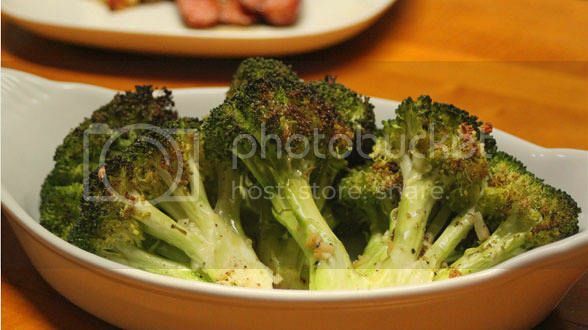 Sprinkle your seasoned broccoli on your baking tray and pop in the oven for 20+ minutes or until your broccoli is crispy brown on the edges. You can find a similar Rachel Ray recipe here. Brussel sprouts might just be my favorite vegetable. (Insert record screech here). Yep, you heard right. I love brussels. Boiled, they are just little gross green balls of cabbage, but roasted, they are sweet, crispy bites of everything you could ever want and need. Okay, okay, so that's one step too far, but STILL, like many things, if given the proper TLC brussel sprouts are the bomb. Directions: Slice sprouts in half. Grab a Ziplock bag. Toss sprouts, olive oil and seasoning in the bag and shake what your momma gave you. And the bag. Don't forget to shake the bag. Spread evenly on a tin-foil lined baking tray and bake at 425 degrees F for 20 minutes, or until edges are golden brown. In a small pot, bring water to a boil. Crack eggs into boiling water and leave for 2-3 minutes. 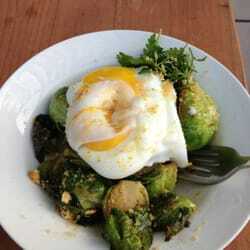 Top roasted sprouts with eggs and dig in. If you did it right, the gooey centre of the yolk will be like a sauce over the top of your greens. Yum. ** If you're not a sprout person (don't tell me - my opinion of you will change forever), this recipe can also be done with roasted asparagus. Just as tasty with the same nutritional benefits! Older PostIt's Confirmed: Breakfast Is The BEST!